Califorias economy is bigger than the United Kingdom. 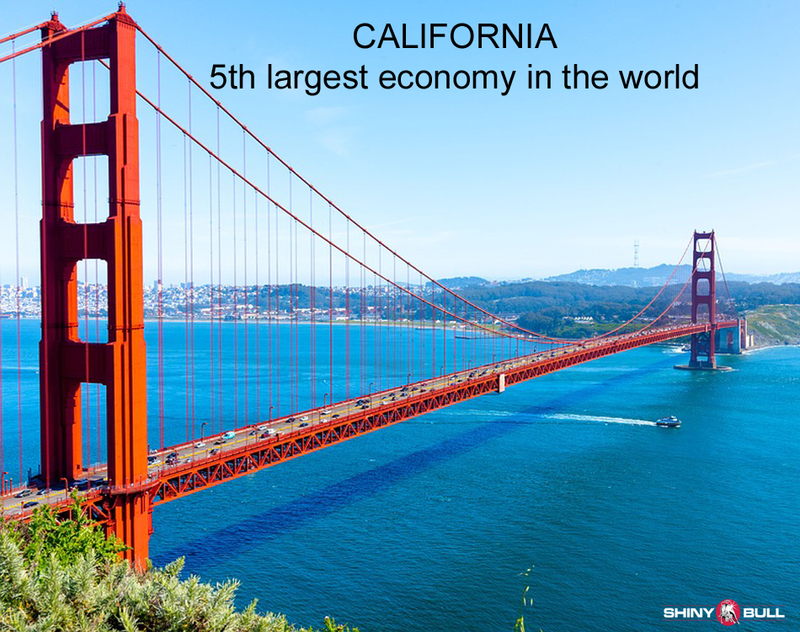 If California were a country, it would be the fifth largest economy in the world. Wow! That is pretty impressive. California is home to four of the worlds ten richest people. Its also home to four of the worlds ten largest companies by market cap. California has nearly 40 million residents and is the most populous state in the United States. Its GDP rose by $127 billion from 2016 to 2017, and their GDP surpassed $2,7 billion, according to federal data. The United Kingdom has 65 million residents. Thats 25 million more than California, but interestingly it has a smaller GDP. The UKs capital and largest city is London, a global city and financial centre with an urban are the population of 10,3 million. Californias economic juggernaut is concentrated in coastal metropolises around San Francisco, San Jose, Los Angeles and San Diego. It has 12 percent of the U.S population but contributed 16 percent of the countrys job growth between 2012 and 2017. California`s strong economic performance relative to other industrialized economies is driven by worker productivity. All economic sectors in California is growing, except agriculture, and financial services and real estate are the best sectors. Second is the information sector, which includes many technology companies. California is known for being rich in gold and pearls, and the gold rush starting in 1848 led to dramatic social and demographic changes, with large-scale emigration from the east and abroad with an accompanying economic boom. Now, you can clearly see another boom; a tech boom. California has a thriving technology sector in Silicon Valley. The worlds smartest tech brains are there. So are the biggest tech companies. But the worlds entertainment capital can also be found in Hollywood, California. All this makes California a global trendsetter in popular culture, innovation and politics. It is the origin of the film industry, the hippie counterculture, the internet and the personal computer, among others. The San Francisco Bay Area and the Greater Los Angeles Area are widely seen as the centers of the global technology and entertainment industries. Many of the richest people live in San Francisco and the nation`s highest GDP per capita in 2016 was $94,000. We have a revolution going on. So was it 150 years ago. The industrial revolution started in England. It was the name given to the first factory automation initially in the manufacture of Textiles. At that time, many current US state capitals did not exist. At that time, London was the biggest city in the world, and England was the biggest trading nation. England produced more steel than the rest of the world put together, and steam engine driven trains were rapidly taking over long distance travel. 150 years ago saw a prolific range of inventions around electricity, culminating in the inventions of the electric light bulb and the electric motor. Inventors in this field at this time were; Frenchmen Volta (1800 the Volt) and then Ampere (the Amp) followed by Oersted, Faraday and Maxwell. These inventors in Europe were followed by the American Edison probably the most prolific inventor of all time (1847 – 1931). Edison produced the electric light bulb, the first public supply of electricity, the gramophone, the movies and the thermionic valve-later the triode. English physicist Sir Joseph Wilson Swan also independently invented the electric light bulb (1860). He also invented Bromide paper (1876) still used today for photographic prints. 150 years ago telephone technology was invented. Initially the transmission of coded text messages over copper wire between England and France by Morse Code and then in the US Alexander Graham Bell invented the telephone to carry voice over the same wires in 1875. Englishman Charles Darwin publishes his theory of «Origin of Species by means of natural selection» (Now of course supported by genetics. Then dangerous and revolutionary thinking flying in the face of the accepted «Creation» in the Bible. Now, California and Silicon Valley is the place to be. A place with economic growth which is higher than the United Kingdom. This is an evolution.